ATLAS is a family of modular, highly scalable integrated access systems that has far-reaching application in today's advanced telecommunications environments. The systems support voice, data and video applications at up to T3 rates over dedicated and switched networks. The chassis includes expansion slots and a variety of option modules, making ATLAS a versatile solution to many of today's wide area networking challenges. 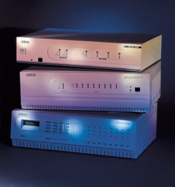 ADTRAN also offers the TSU 600e and TSU 120e for smaller capacity integrated access and the Total Access 750 for network service providers. This enterprise system supports voice, data, video, and Internet applications using up to 34 network interfaces over multiple T1s or T3 through dedicated and switched networks. This integrated access device offers the same functionality as the ATLAS 800/800PLUS in a NEBS Level 3 compliant chassis. This multi-T1 platform converges voice, data, video, and Internet traffic and offers call routing and Lifeline POTS over TDM, Frame Relay, or a hybrid simultaneous mixture of up to four network interfaces.